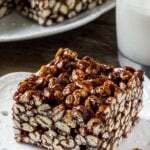 Puffed wheat squares are a classic, easy treat that always reminds me of childhood. They're chewy, gooey, full of chocolate, and you can whip up a batch of these no bake treats in no time. Add the butter, corn syrup, brown sugar and cocoa powder to a large sauce pan over low-medium heat. Melt everything together while stirring gently. Bring the mixture to a gently boil for 1 minute, then remove from the heat. Stir in the puffed wheat cereal. Spoon the batter into the prepared pan and press down (I use a lightly greased spatula for this. Allow to firm up at room temperature for 60 minutes, then cut into bars. *Do not use Sugar Crisp or other puffed wheat cereals where each kernel is coated in a sugar or honey coating. **Store bars in an airtight container at room temperature.